Do you remember, several years ago there was this trend going on called color blocking? I loved it, I still do, because I love cheerful colors and patterns. I went crazy doing all these colorblocking and patternmixing at the time. Well, I still do, because I don't really care for trend. As long as it doesn't look too weird, I just go for it! And I encourage you, too! If you happen to like bright and cheerful colors, just go all out. It's summer time, and happy colors can lift your mood and those around who have to look at you! You will see that all the looks I share here were not for the office. They were for going to the movies after office hours, running errands, visiting relatives, and going to Church. Mind you, brashy looks have their own place, too. My office is quite conventional, so I won't go that crazy. However, if you work in a creative or art industry, it's much more acceptable. Just use common sense whether or not a particular look will be appropriate for a certain time, place and situation. Coral, white, jeans, mustard yellow, and turquoise to go to the mall. The color yellow always signifies cheerfulness, the sun, lemonade, and summer. Grab yourself a bright yellow tote and you can transform even the most humdrum look into a don't-worry-be-happy look. Meanwhile, the crocheted style white layer is always useful. You can use it for modesty, to add style to your look, to provide a little bit of coverage from the scorching summer sun. I found it to be a good investment and have worn my white layers many many times. White, shocking pink, orange, deep mint, and colorful sandals to visit beauty parlor. Bright lemon yellow, red, deep tosca, and stone-washed jeans to go to the movies after work. I'm not a big fan of the color orange, but I have to admit that the orange capri pants that I got several years ago have had many mileage and turned out to be easy breezy to style with other pieces in my wardrobe. If you want a splash of summery color but not a fan of "hot" colors, tosca is perfect for you. See how pretty and versatile my tosca purse look combined with other colors? 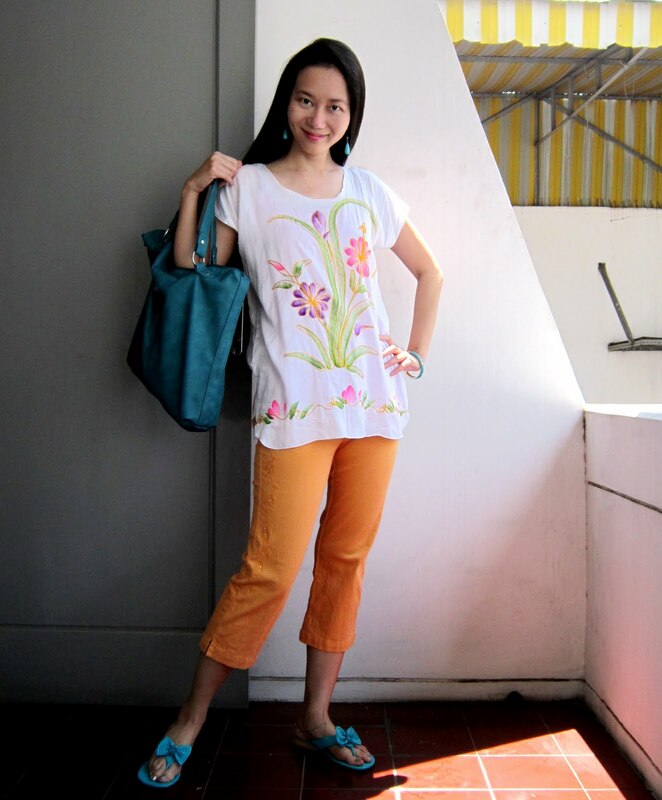 Light blue with colorful pattern, coral, turquoise, sky blue, and fuschia for a Sunday stroll at the mall. Colorful flowers on white, deep tosca, orange, and turquoise for a touch of Fall look. Again with the sunny orange and various shades of mint. Bright yellow, colorful flower necklace, and pink. Just change it around into red dress with mustard yellow purse, add the happy flower necklace again, AND the cheerful wedges, then finish with dark denim to visit relatives on auspicious Lunar New Year. Fuschia, mint, jeans, turquoise, and deep tosca go well together. I love the burst of colors during summer time. Get those colorful accessories, sandals, and clothes out of your closet and flaunt them. They do no one good just sitting in your closet. If you're shy of colors, just wear one color that would pop up as an accessory: like the tosca sandals that I wore, or a colorful flower bib necklace. You can even carry a hot pink bag to happy-fy (is that a word?) an all black or an all oatmeal-color ensemble if monochromatic is your style. A very happy-looking momiform: striped yellow, red, stone-washed jeans, and red. Going to Church? Well, I didn't want to blind my fellow Church goers with bold colors, so I opted for clashing pastels, instead, in soft coral and mint! And last but not least, even a simple top and jeans combination have a new life when you throw on a bright pink purse to finish the look. So many wonderful colorful outfits! Love them all! Come and link up at Beauty by Miss L Weekly Fashion Link Up! Cute, vibrant and joyful outfits! I love all your color combinations. I tend to over work the black and white issue because it is so easy to wear and accessory but it gets old. Color pop with denium is really cute. Thanks for sharing. Visiting from What Joy is Mine. So cute! I love the brighter colors in the summer. I have been trying to go a little brighter and bolder, just for fun. Thanks for the inspiration! I REALLY like the pastel outfit with the combination of pastel pink, mint, and white. Such a sweet, feminine outfit that I would wear as is. Keep up the good work! So many pretty outfits! I never did try colorblocking, but I do love color! You are an expert at it, and look lovely!! So many vibrant outfits! My favorite is the one with the fun rosette necklace. You have a neat fashion sense. I loved all the color combinations. It's the perfect time of the year to bring color to our wardrobe. Thank you for sharing at Monday's Musings.